Continuing yesterday’s ode to the Lowrance LCX-113, I’ll explain how I’ve been using it to test GPS sensors against each other. 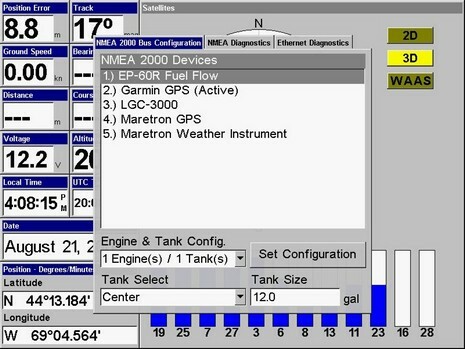 Every NMEA 2000 MFD and instrument I’ve tried can handle multiple GPS (and other sensor) inputs, which is good, but they do it with a variety of styles. Some—like Raymarine’s—just grab the first one they see coming down the backbone and use it, unless it pooches out and then they will use another if available (aka “roll over on failure”). Others, like Garmin’s and Simrad’s (NX models excepted), will pick one source automatically but will also let you choose from a list of redundant sources if desired. Lowrance, as I’ve discussed before, goes a little further, letting you use more than one redundant source at once. 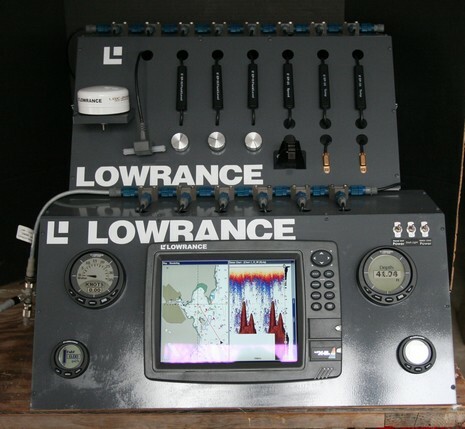 But Lowrance does something special with GPS, because those sensors send out Dilution of Precision (DOP) values based on the strength and breadth of satellites they’re locked onto. 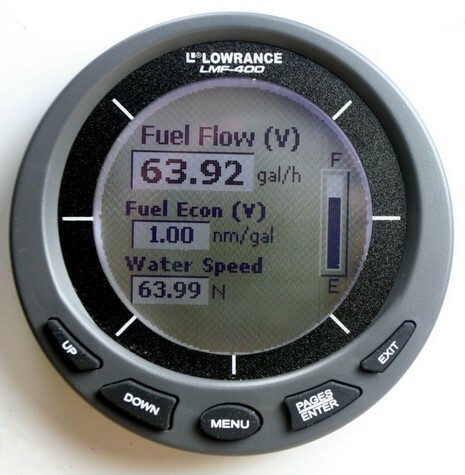 Hence, the LCX works with redundant GPS sensors like a Garmin or Simrad, but also has a feature that automatically picks the GPS which says that it’s most accurate. In other words, the darn thing is a test machine! So, as you can see above and below, I networked it with a Maretron GPS100, a Lowrance LGC-3000, and the new Garmin 17x. I tried the trio in the difficult conditions outside the lab—three story building to the North (blocking the low WAAS bird) and tall, densely foliated trees in every other direction—and I tried them during last week’s long trip around Eastport. The results were quite consistent; the LCX almost invariably picks the Garmin as the best source, and if I remove the Garmin, it picks the LGC-3000. But the fact is that any one of them will do a fine job out on the water; high performance GPS sensitivity mainly counts in urban canyons and under tree cover, and a few meters of accuracy doesn’t mean much given the inherent accuracy of our charts. But I sure like the idea of redundant GPS sensors, particularly from different manufacturers, as we’ve seen little GPS system changes affect specific models. GPS shoppers should also note differences in mounting options. 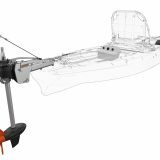 The Lowrance and Garmin models below are a little easier to install as they have twist off bases that you can screw down (or back fasten), as opposed to the one-piece Maretron which must be back fastened through precisely drilled holes. All three of these come with alternate pole mounts, but the 17x also includes the under-deck mount we saw in June. But then again I’ve heard that Maretron is coming out with a completely new GPS. Next story Cell Ranger Stix, worth a try? Interesting. There don’t seem to be specs that relate to the test you did from the manufacturers that I am aware of so it is good to see. I recently bought the Maretron because of its 10 Hz position rate vs the 1 Hz of the other models. Does that make any difference in your opinion? I’d always want better GPS accuracy myself, and also more accurate charts to match. But regardless of the charts, if you have tracks that show safe passages and waypoints that show dangerous rocks, the more you can trust the GPS the more useful those are. BTW, any news on e-Loran and chartplotters that support it? That would be a very nice NMEA 2000 feature. Of course, now we are going to have an arms race where the mfg who reports a small DOP, regardless of its truth, will “win” on your “test machine”. This a problem I see a lot. A mfg realizes that testers are willing to take the shortcut. Put the flashy label / low DOP on the screen, and they are like, yes, a low DOP. Meanwhile, the careful mfg, who actually spends time quantifying their DOP and reports a slightly higher one to be conservative, get’s dinged. I’ve seen car navigation units show a tiny DOP as they plot me way off my course. SCARY! Of course, they are sure to win in your test given they basically were interpolating but still reporting low DOP. Drew, I’m not positive about any of this but I think 10 Hz GPS data is good for overlay and autopilot if you don’t also have fast heading on the bus. But I also suspect that all the N2K GPS sensors are outputting 10 Hz. There are two PGNs called “Position, Rapid Update” and “COG & SOG, Rapid Update” that they all seem to put out. I’ll check further and/or maybe a reader can chime in? Norse, there are Loran PGNs in the Standard, but I don’t know of an N2K eLoran in the works. I agree, it would be a good thing. Having three redundant GPS sensors doesn’t mean diddly if the GNSS system fails or is spoofed. Fair criticism, John D! I’d like to think that DOP is a fairly straight-forward formula, but maybe it is being gamed. I don’t know. On the other hand, I spoke to a Lowrance engineer this morning and he wasn’t surprised that their unit came in second to Garmin. Apparently the 17x is using the newer Sirf III GPS chip, while the Lowrance (and Maretron) are still on the last generation (but will upgrade). But let me repeat that overall this is not a big deal. 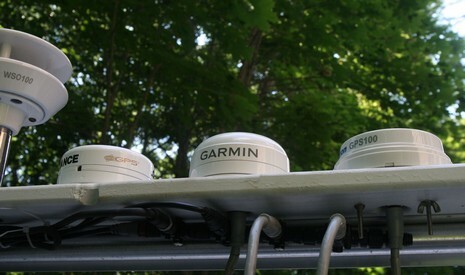 All these sensors perform very well on the water (with a wide open sky view). A quick check of the SirF III Chipset specifications shows that even this latest product from SirF has a maximum refresh rate of 1Hz which is typical. Only the latest and very expensive GPS Chipsets will output COG/SOG/LL data faster than 1Hz and you won’t find them in any $200-$300 Marine GPS yet. The NMEA2000 Rapid Update PGNs may be sending out 1OHz information but, it is the SAME INFORMATION SENT 10 TIMES and will only refresh when the chipset updates the next second!!! Panbo readers shouldn’t be fooled that it is any faster or more accurate than 1Hz at this time. DOP is a straight-forward mathematical expression which measures the geometry of the satellites. If the GPS units are in the same place at the same time using the same satellites, the DOP values will all be exactly the same. Any that are different are just wrong. So the sensitivity of the GPS does not come into play unless that changes the satellites being used. Also, some GPS units may mask off low altitude satellites. For a two bearing fix, the best DOP is at 90 degrees. One with the bearings only a few degrees apart will have poor DOP. For a three bearing fix, you would try to space them 60 degrees. For GPS, where the satellites are in 3D space and where there may be a dozen of them, the math is harder and the answers are not very intuitive, but the GPS does it all for you. The EPE numbers are a different story. I don’t believe Garmin has ever revealed how those are calculated. I actually worked on some embedded systems programming for underwater navigation devices. We used a similar set of calculations, and worked on weighting different transponders depending on basically the intersection angle. The intersections of the circles (spheres really) from multiple sources is never in one place. The error in your position introduced by a ranging error increases as the angle between the sources decreases. So if you generate a number of possible intersections, you can get better results by counting the intersection at 90 more (as norse points out) then the intersections at a few degrees. Here’s where my lack of familiarity with the GPS space comes through. My understanding has been that DOP is basically a unitless ratio of errors. Mfgs then convert this into that circle you see. Because they are estimating the position subject to random range errors to the sats, the DOP in meters is also an estimate, basically at some confidence interval. I pick a low confidence interval, DOP drops. I pick a high one, it increases. So can DOP expressed in meters be gamed? I’d assume so. There are a lot of factors going into the conversion. Almost. DOP is unitless. If it is expressed in meters, it’s not DOP. The GPS fix is the intersection of the spheres of position from each satellite, and each of those has some error because of the range error (due to atmospheric propogation etc). The DOP and the estimated range errors taken together can be used to give an estimated position error in meters. But that should be called something else, like EPE. Commonly, the position is shown as a circle to show the possible error. Note that the actual confidence “interval” on the position is not really a circle. I’m not sure I’m following this correctly. The Maretron GPS100 claims a ‘Position Update Rate’ of ’10 per second’ but it uses a chipset rated at 1Hz? so you get the same data 10 times. How can the Maretron put out faster information that what is gets from the chipset??? I checked the data sheets for all of the SirF III Receivers at the link above and they all say 1Hz. Since boats don’t turn on a dime, and the information is ultimately used by the MARPA feature in a radar that is already getting inprecise data from magnetron, using software should be good enough to produce a 10hz at least half as good as a compass/gyro combination. Rather then moving towards 10hz performance, it would seem that the state of the art is moving towards the combination of 1hz GPS with other sensors such as three axis accelerometers, so the heading can be determined irrespective of the pitch and roll at the GPS’s location on the vessel. Your suggestion to mix higher speed heading (ie Rate of Turn) information with 1Hz GPS L/L, COG, SOG information is typically what is already done today. However, there is a new trend among GPS manufacturers to produce real L/L COG, and SOG information much faster than 1Hz. This drive is for the new unmanned aerial vehicle markets where a 1 meter or smaller remote controlled vehicle (like a small airplane or helicopter) needs very fast updates in order to fly in an urban area. Some of the new GPS Chipsets can produce accurate SOG/COG/LL information at up to 20Hz. This is because the number of correlators in the chipset has increased geometrically in the past couple years. Anyway, it is OK that the current marine manufacturers use 1Hz GPS Chipsets which cost less than 15 Euros. However, companies like Maretron should be honest with their customers and tell them that the true update rate is really 1Hz instead of telling them that the update rate is 10Hz because the SAME INFORMATION is simply repeated 10Hz. I thought that Ben may comment and have investigated this issue as well by now. Being a mechanical engineer I’m not much of an electron chaser, so bear with me. Could it be that some of the devices in the network can miss the data if it is transmitted at 1Hz? In other words, if a device is busy, will it miss the update? If so, wouldn’t sending identical data a number of times ensure that all the networked devices receive it? 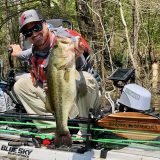 With charts and GPS receivers getting ever more accurate, we are reaching the point where the length of the boat has an impact on positional accuracy. My GPS receiver, for instance, is mounted on the rear of the boat – roughly 13 meters from the bow. It would be handy to be able to enter offsets into our MFDs or, even better, use two GPS receivers (bow and stern) and average their position readings. Regarding the discussion of the Maretron GPS position rate above, Maretron has a FAQ page which explains this. 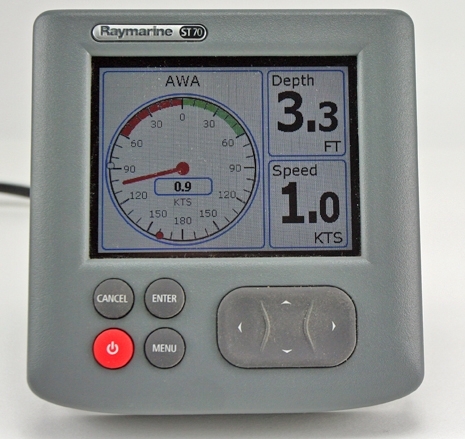 The National Marine Electronics Association (NMEA) specifies a default transmission rate for all NMEA 2000 messages. The default transmission rate for position is 10 times per second, which Maretron adheres to even though the GPS100 only computes a new fix 1 time per second. This means that the GPS100 will transmit 10 identical positions before starting to transmit the next position fix. There is a side benefit to this over transmission rate, and that is that the new position fix is guaranteed to be on the network within one tenth of a second after it is computed. 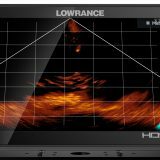 It seems that Lowrance has updated its gps antenna, the LGX-4000, to a true 5 hz position update at least according to its website. Are there new chipsets that make this possible or is there something else going on? Is there any feedback on the unit yet? Looks like your response didn’t post here. In any case, I think it would be great if you could get more detailed information on what is going on with the gps receiver market. It has to be changing very rapidly with all the new devices having gps receivers including smart phones. Any links to more detailed information would be appreciated. Can you please help me with my problem? I have LCX-27C with LGC-3000 GPS module. I’m not getting GPS not responding message but unit doesn’t locks on satellites and I see only one signal bar on status page. Does that means that GPS LGC-3000 must be replaced if yes then which GPS antenna will be better or it can be fixed and how?